Tomorrow is the previously mentioned Dubai Creek Striders Half Marathon, and I am gonna run it!! Yes, I will. If you have read my previous post, you will know that I got a muscle tear in my thigh two weeks ago. My first injury ever. Complete new territory for me. How to handle it when the most important half marathon is just around the corner and when you are in the middle of the most crucial part of full marathon training ? How to stay calm? What to do to speed up recovery? I warn you: Be ready for pain. That's all I can say. Those two are self-torture tools. But they do loosen up knotted muscular tissue in the same way a physiotherapist will do in several sessions, just for so much less money, as you can do it as often as you can stand the pain. If you have masochistic tendencies, it will be of advantage. Sufficient rest and a lot of massaging got me to recover well enough and just in time for the half marathon. I got the green light from the doctor too, although he said I should be wise enough to stop if the pain flares up again to an extent that is not healthy. So here I am, alarm clock set for 4am, bag packed, clothes laid out, and water bottle beside me so I'll arrive well hydrated at the start line tomorrow. I ran a half marathon about a month ago and my time was 1:37:11. I want to get to 1:35:00. I am not sure if tomorrow ill be the day. It is quite warm (a tad too warm), and there is a chance for rain. If anything will help me get there in 1:35, it's my well rested legs, as I have hardly been running for two weeks. I'll keep you posted on the results. Meanwhile I have been cooking, baking and photographing quite a lot over the past two weeks. The time that I used to spend running had to be spent otherwise. Not necessarily a bad thing. Today's recipe is another grain-free granola bar that I have been throwing together with whatever I had at hand. I love having these in the fridge, especially at times when I run a lot and hunger hits me often and hard. 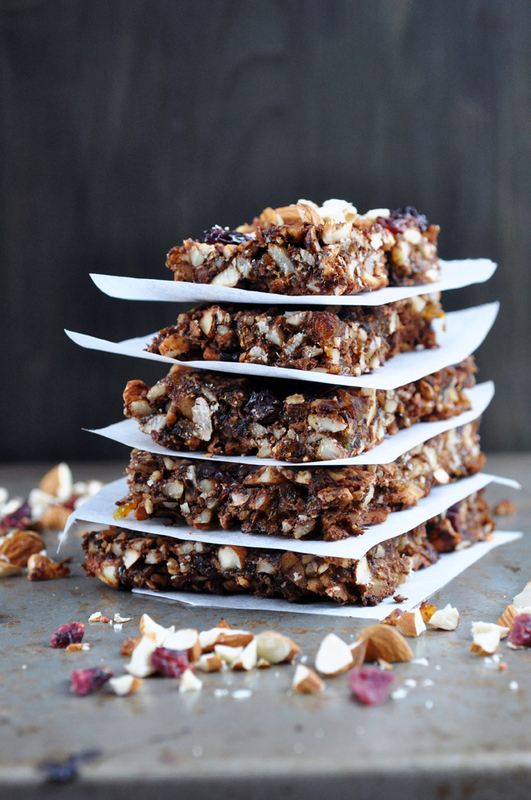 These are sweet and satisfying with all the goodness of nuts, flax meal and cocoa. Enjoy! UPDATE: I finished the half marathon in 1:38:33. Not a PB, but my leg was not to blame for it. It was the weather conditions: far too warm and humid. I felt I was putting a lot of effort into my running, but wouldn't move fast enough accordingly. Thanks for your support and all your comments. Preheat oven to 180C. Line a 20cm square tin with parchment paper. Put the raw almonds in a food processor and pulse until roughly chopped. Add all other ingredients, except the apple sauce, and pulse a few times until medium to finely chopped. Add the apple sauce and blend until mixture sticks together in one lump. Press the mixture into the prepared tin. Bake for 30 minutes or until edges become golden brown. Let cool before cutting into squares. Keeps well in the fridge.